If you want to grow your career in the construction sector, a winning resume is of prime importance. The construction industry is diverse, ranging from construction management, construction assistance, labor work or supervision. When you craft your Construction Resume, you need to place your skills and experience in a palatable outfit to ensure optimum visibility. You need to showcase your hallmarks to get picked up by top construction firms. 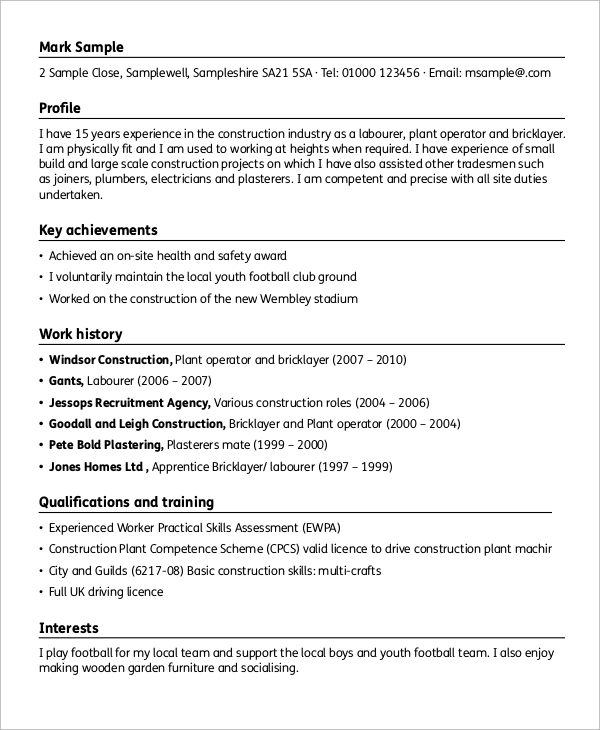 Here are some sophisticated Sample Resumes for professionals in the construction sector. 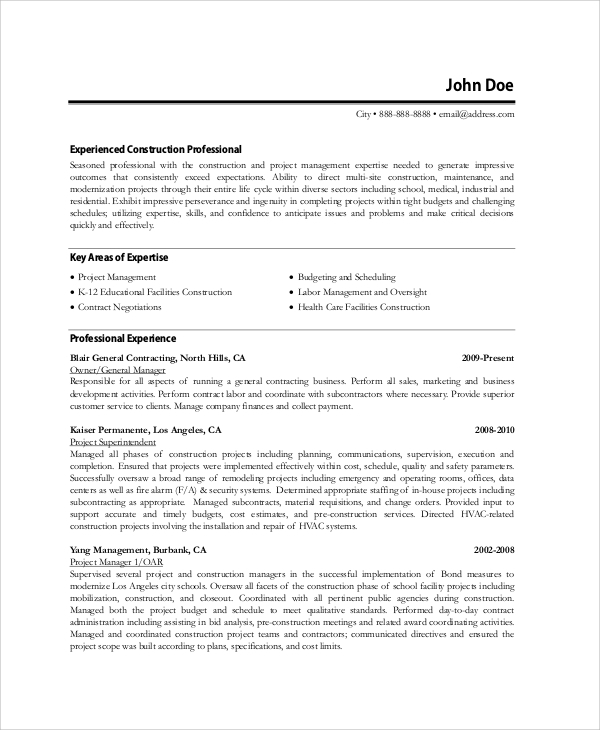 Experience is the most important factor of a construction Project Manager Resume. In this template, it is placed at the top, followed by other qualifications and educational benchmarks. You can also start off directly with your skills, ability and willingness to work for a reputed company as a full-time construction assistant. Use bullet points to sum up your potentials. 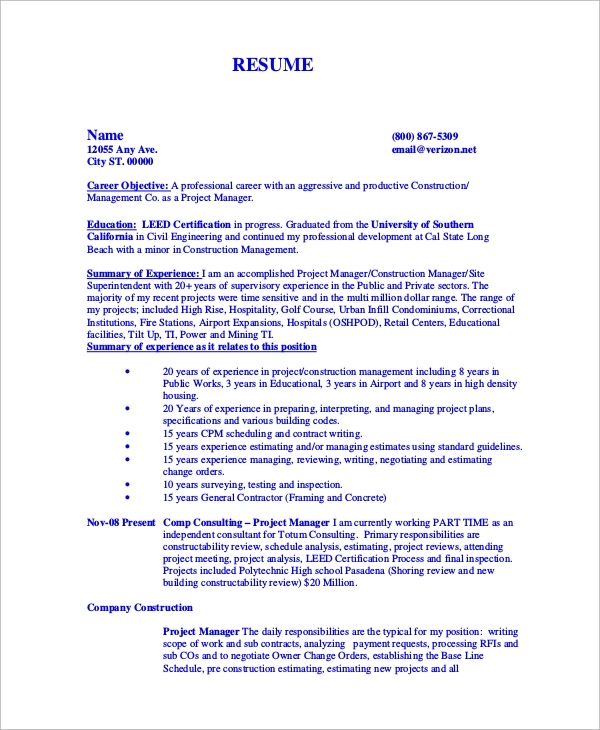 This is a well-formatted construction management Resume Samples with different aspects like career objective, education and works summary placed sequentially. Be detailed with the summary and mention the time span regarding years while including different job positions. 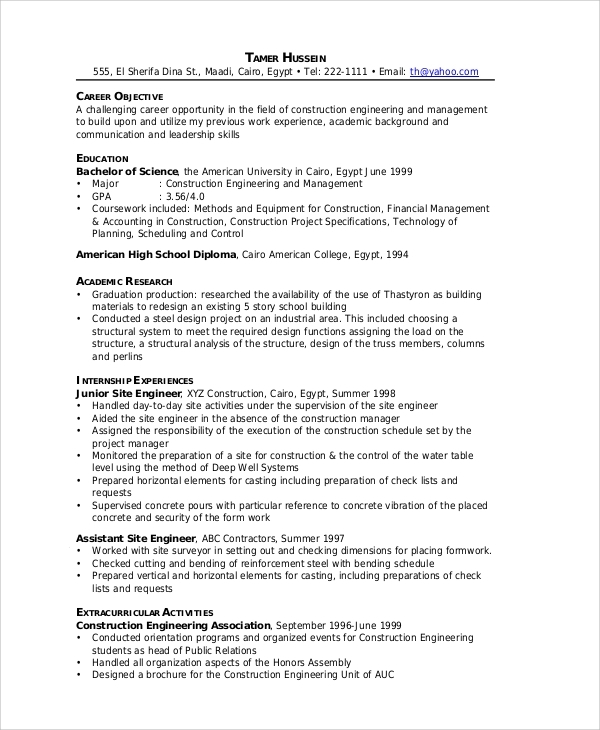 How to Make Your Construction Resume Effective? 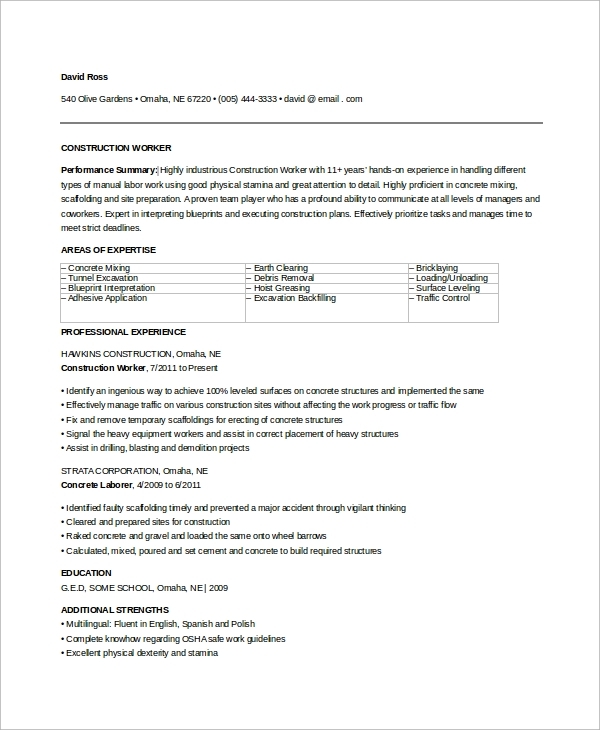 You need to be strategic and diplomatic with the way you put forward the details in your Sample Construction Resume. For instance, if you are applying for the post of a project manager, the best way of selling your profile is to include the management skills at the top. 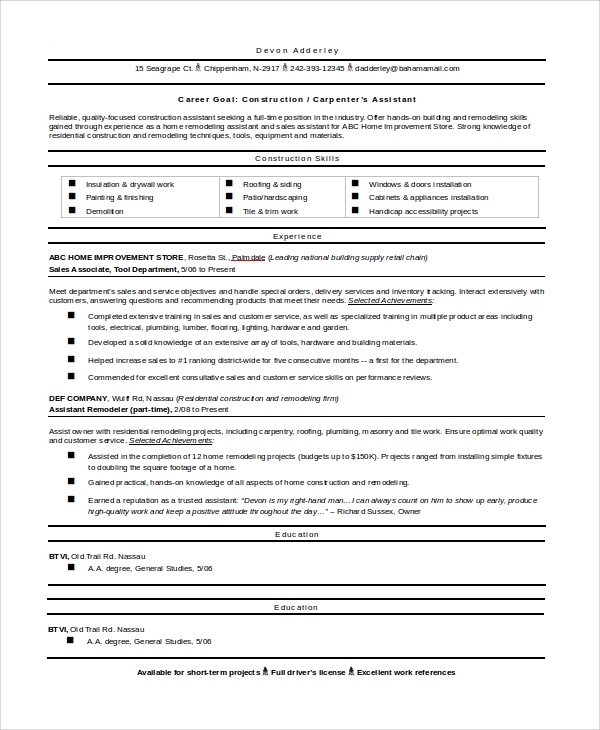 Place your experience with reputed companies at the upper part of the resume so that the recruiters can assess your skills. Add specific action words like installation, controlling, debris removal, pouring and other strong verbs that make your skills stand apart from the others. In a nutshell, you have to make your resume crisp with your uniqueness that will be of help to the company. Engineering construction employee profiles require polished educational qualifications. It is wise to start off with the career objectives and move on to the certifications and educational qualifications here. Be precise with the job experience before the application of the job. The resumes for housing construction personnel can be crafted in a traditional format, with the photograph, contact information and personal details at the top. The educational qualifications, work history, and skills are included after that. 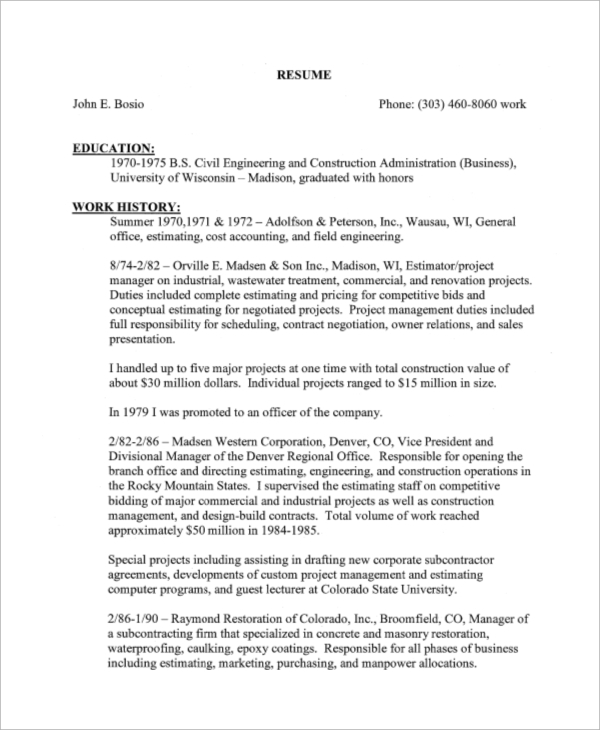 How Can a Stellar Construction Resume Benefit Your Career? 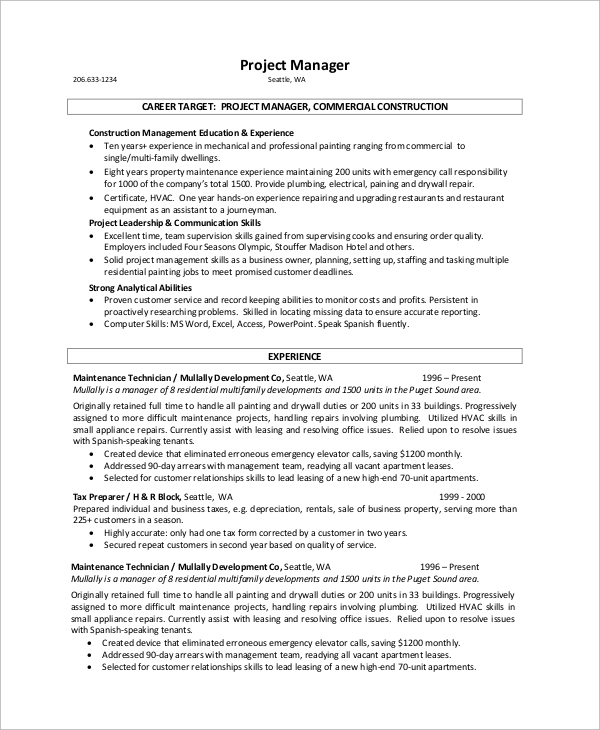 A streamlined Construction Resume Samples always benefits an employee, especially when there is a lot of competition in the industry. When you craft a well-planned resume to leverage your career, you will find it easy to zoom ahead in the race of stiff competition. Even when tough competitors have lined up ahead of you, it is the resume that enables you to get a higher pedestal in the industry. You can also highlight your soft skills , management, and motivational skills. You can also use figures, for instance, the strength to lift a weight of 120 pounds or so. This makes your resume refined and enhances your career opportunities. The construction industry has a lot of scopes, but the competition among trained labor has turned out to be neck-to-neck. If you desire to shine in your career, you need to tailor the resume as per the profile of the company. 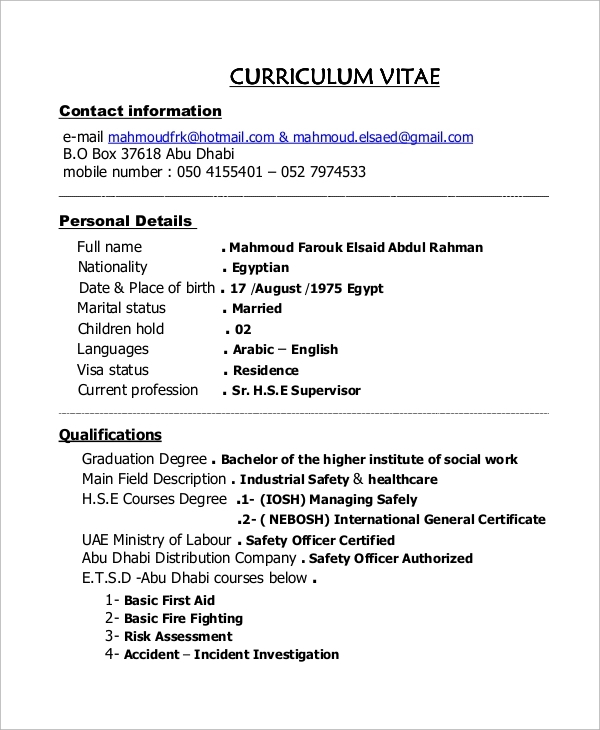 There are various Resume Examples on the website for you to check out. You can browse through the pages and grow your concept about how to make your resume sharp and unbeatable.